Soutache (pronounced soo-tash) cord is made of two rows of cording wrapped in thread with a tight groove down the center resulting in a narrow flat decorative braid with a herringbone pattern. Soutache (the term can be used without the word "cord") has traditionally been used in couture to conceal seams and embellish clothing and fashion accessories. The word soutache is believed to originate in France--where it was first used in the 1850s--deriving from the Hungarian word sujtas, meaning "braid used as trim." Soutache has also been called galloon, from the French word gallonner, meaning "to adorn with lace." Soutache, like parachute cord, comes to jewelry-making from military applications. Metallic soutache has been used for centuries on military clothing to display rank and embellish dress uniforms, and later adapted for athletic uniforms to list player names and numbers. It can also be seen on police uniforms, historical clothing, religious regalia, home décor and more. Soutache commonly displays a woven herringbone pattern, historically made using wool and silk although synthetic fibers are now also used. Soutache cord embellishment has been historically seen in clothing around the world, and was especially popular in Europe during the Victorian Age. Soutache embellishment is often seen in traditional clothing from Russia, Morocco and Mexico--as well as being used in haute couture and bridal gowns. However, it took until 1987 for this component to make the leap from runway designers to jewelry makers. 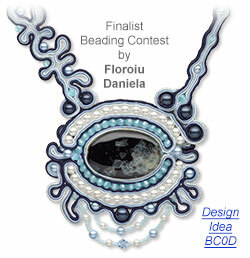 The first person to use soutache cord in modern jewelry design was Dori Csengri, an Israeli-trained fashion designer. She was studying in Paris and began experimenting with textile collages, including soutache. She developed embroidery techniques to work with it, and began creating lapel pins and other textile-based jewelry. She used soutache to hold beads, capture crystals, provide a base for cupchain and became the heart of a new jewelry design movement. 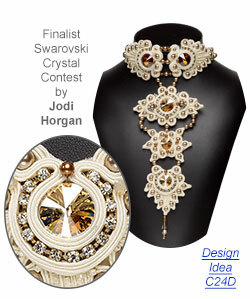 Jewelry created using soutache frequently features beads, crystals and other elements "captured" between strips of cord. These components are usually drilled, so they can be stitched into place within the folds and curls created by the artist. Soutache can be layered together, similar to layers of lasagna or baklava, to create high-contrast colorwork or ombré-style shading. The stitched-together braids are curled, folded, looped and shaped to outline beads and accentuate other bead embroidery. 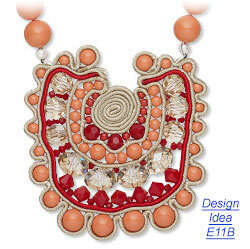 Most soutache-based designs jewelry makers may see will be complex bib-style necklaces, as they have the most visual impact. However, soutache can be used anywhere. Since soutache jewelry is frequently backless, crystals and translucent beads captured in soutache earring designs allow for full play of light through and on them. Our in-house jewelry designer Jamie Smedley created this soutache-based necklace and earring project, using bead embroidery and basic sewing stitches with Swarovski crystal pearls. Soutache designs are also popular as brooches, bracelets, hair jewelry and home décor. Adapt Jamie's design, get inspired by the other soutache-based jewelry in our gallery, or go wild with your own ideas and patterns. The possibilities are only limited by your creativity!